I am always, always, always on the lookout for new makeup brushes. Not that I don't love my eyeshadow brushes from Shiseido and Smashbox -- I do, and I'm very loyal to them. But after awhile, there's just so much shadow and gunk that can build up on them before they take a cruel and unusual beating. Luckily, I recently discovered the fabulousness of Eco Tools. 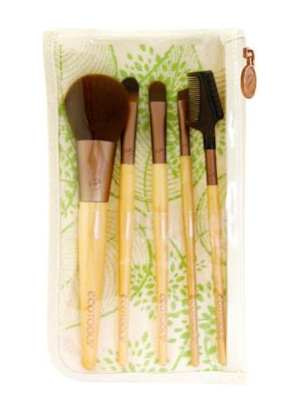 These brushes are crafted with such care for the environment -- each part of the brush is working toward sustaining the earth's natural resources. The bamboo handles alone have a surprisingly low impact on the earth, as bamboo can grow up to 4 feet each day! And the bristles are designed in animal-free taklon, which is a synthetic hair that is still amazingly soft and pliable. Even the pouches they come in are reusable and printed in plant-based ink! My one complaint is that it takes a bit of effort to get the brushes out of those pouches. You really have to squeeze them out -- it took me a good 45 seconds until each was free of the packaging! But once that happened, I was quite pleased with what lay before me. My three must-have brushes from this collection are definitely the Angled Eyeliner Brush, which is perfect for turning your favorite shadows into liners; the Eye Shading Brush, whose slightly wider silhouette makes sweeping shadow across the lid absolutely easy and so much less time-consuming; and the Lash & Brow Groomer, which helps to get rid of any mascara clumps in seconds and keeps all your stray brows in place with a couple quick swipes. All in all, these are definitely a must-have -- they're great for the environment, they're super-cheap, and they work wonders. What's not to love? The Eco Tools 6 Piece Brush Set retails for $12.99 at drugstore.com. Aren't these awesome?! Green AND budget-friendly, which obviously wins me over :) Plus, you won't feel too bad about replacing them when you need to. I should change my brushes now too. Anyway, there is no harm when trying other things.